Hiking, camping, running, kayaking, canoeing, swimming, bicycling, picnicking, horseback riding, and (of course) gazing at wonderful trees—there’s a long list of ways to enjoy Humboldt Redwoods State Park. Start at the visitor center and branch out into one of the finest forests in the world. Bring water, appropriate clothing, and a park map. If you have an hour, drive the 32-mile-long Avenue of the Giants. 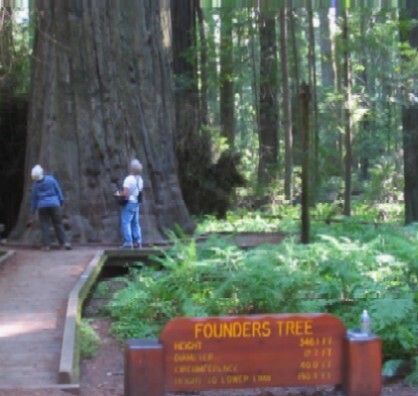 Stop at the visitor center and admire the 300-foot-tall redwoods on the Gould Grove Nature Trail. If you have half a day, take a drive on the Avenue and explore the lush forest on a 1.3-mile-long trail through Founder’s Grove. Walk along the fallen Dyerville Giant. in the morning. Somewhere along the way (possibly in the excellent swimming hole beside the hearthstone), take a dip in the South Fork of the Eel River. In the afternoon, explore Rockefeller Forest, part of the largest expanse of old-growth redwoods on the planet.